New York City is a place all it's own. Between seeing the Statue of Liberty, strolling through Central Park and experiencing the lights and sounds of Times Square, you're definitely going to work up an appetite. Luckily, NYC is the best place to be when you're stomach starts grumbling. From gourmet, grab and go, casual and every other eatery imaginable (and even some unimaginable), you can satisfy even the most unusual appetites. Bagels, New York style pizza, pastrami sandwiches, and the newest, hottest food trend, can be found on every street corner. It takes a lot of hard work and plenty of kitchen and restaurant supplies to feed the millions of locals and tourists buzzing through the Big Apple. 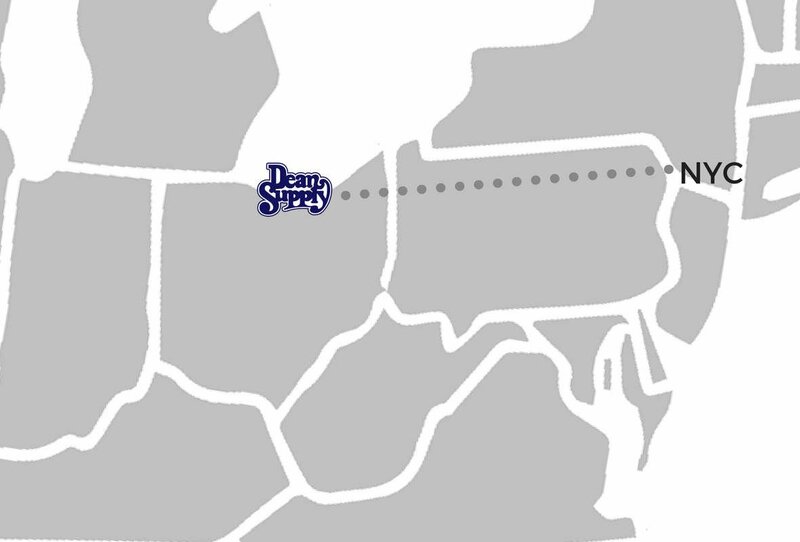 That's where Dean Supply comes in to help by being the best restaurant supply for for NYC, Brooklyn, Queens, Manhattan, Staten Island and The Bronx! As your premier Manhattan restaurant and bar supply store, we can help outfit your establishment with everything you need to feed the masses. From restaurant flatware, bulk commercial glassware, bar supplies, cleaning tools, kitchen equipment and so much more, you can start up a new business or refresh your current look without breaking the bank. Our Cleveland warehouse is stocked full of over 14,000 items that are waiting to be quickly packed and shipped to your NYC doorstep. We will do everything we can to ensure you get your products quickly and in perfect condition so you can focus on what matters most - your customers. With a huge selection of commercial restaurant equipment, we can outfit your bar, cafe, hotel, food truck, restaurant or deli with the best undercounter refrigerators, chest freezer, bar coolers, deep fryers, blenders, and so much more to keep you running at your most efficient. Plus, most of these kitchen equipment items are at rock bottom prices - some with free shipping to boot. Next time you're wondering where to buy Manhattan restaurant & bar supplies or commercial kitchen equipment, think Dean Supply! Need a little inspiration? Whether you are opening a new restaurant in New York, New York or you're looking to refresh your current restaurant equipment, we have the ultimate resource for you: The Dean Supply Reference Guide. This is a carefully crafted guide that is packed full of new trends, hot items, and information on the essential restaurant equipment pieces you need to run a successful restaurant, bar, cafe, party center, or home kitchen in NYC.